› Author AffiliationsI.P. is thankful to UGC (Grant No: 6405-13-044), New Delhi for a fellowship. 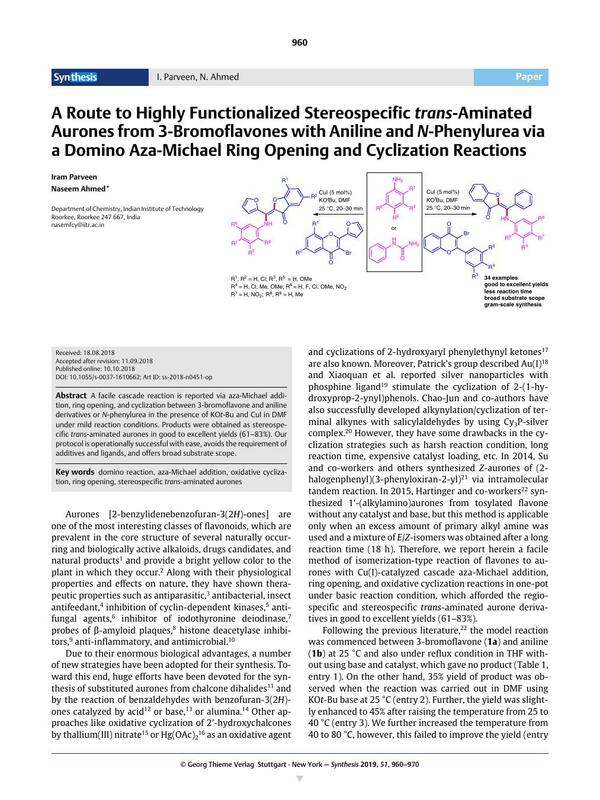 A facile cascade reaction is reported via aza-Michael addition, ring opening, and cyclization between 3-bromoflavone and aniline derivatives or N-phenylurea in the presence of KOt-Bu and CuI in DMF under mild reaction conditions. Products were obtained as stereospecific trans-aminated aurones in good to excellent yields (61–83%). Our protocol is operationally successful with ease, avoids the requirement of additives and ligands, and offers broad substrate scope. Supporting information for this article is available online at https://doi.org/10.1055/s-0037-1610662.